I know, I know… I’m a little late posting this, and you probably already know about it! The point is, I’m posting it now, after a crazy, long week. 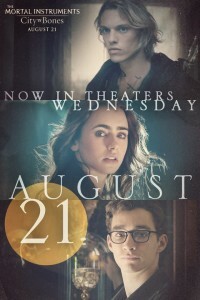 I am excited that The Mortal Instruments: City of Bones is being release early on August 21st! On another exciting note, we are hoping to bring you some awesome City of Bones exclusives next week (from BEA), and it may include a giveaway! So, stay tuned! Log in | 52 queries. 0.935 seconds.